We've got a really lovely collection of panda crafts for kids of all ages here, including panda origami, pom pom pandas, paper plate pandas and more! All you need is a paper cup and a polystyrene ball, plus a few easy craft supplies, and the kids can create this superb panda! Imagine how lovely a window-sill full of pandas would look in the classroom! A piece of black origami paper and a little patience turns out this cute little panda - perfect in all sorts of craft projects! The folds for this model are relatively simple but there are quite a lot of them. Not for absolute beginners! Here's an easy sewing project for kids - who will be thrilled to show off such a cute and useful bag as the finished result! 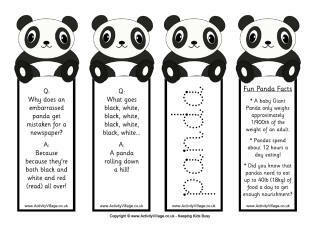 Kids can whip up this panda magnet in no time, and display it proudly on the fridge! Alternatively, instead of attaching a magnet to the back you could attach a safety pin or brooch back and wear your panda! Kids are sure to enjoy making this panda mask. All you need is a white paper plate and a few simple supplies from the craft cupboard. Not only is the completed mask fun to wear, but it looks great on display, too. Simple but adorable, this paper plate panda is made in no time with some simple cutting and sticking. A great panda craft project for younger kids. Who would have thought a collection of black and white pompoms could turn into this adorable panda! Easy for kids of all ages to put together - and I expect the finished panda will be treasured!